In what ways are Steve and Nathaniel soloists? Beyond the newspaper story, what are the deeper reason(s) Steve became interested in Nathaniel? "Nathaniel has one thing going for him right now. A friend." In light of the plight of the homeless, many of whom are mentally ill, do you think this perspective goes far enough? How were visual images or sounds used to portray themes in the movie? What do you think of the Recovery movement that is portrayed by the counsellor at The Lamp: "I don't have a whole lot of use for diagnosis."? How do both Steve Lopez and Graham Claydon (the Christian music teacher) become violent against Nathaniel in their attempt to help him? What does the movie suggest about the nature of grace? What did Nathaniel gain and lose as his friendship with Steve continued? Reflect on your own encounters with a homeless person. Were you able to look them in the eye? 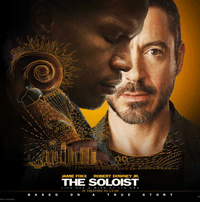 What biblical stories does 'The Soloist' remind you of, and why? How does listening to music (and appreciating other art forms) bear witness to the Spirit working in the world? Our attempts to help others sometimes backfires and has unintended results. How do we know if we're succeeding? How can we frame a situation so that the Spirit can heal?